If you are dreaming about a cowboy or a cowgirl who is going to turn your life around and fill your days with love, laughter, and joy, maybe it is time to stop dreaming and turn your fantasies into reality. 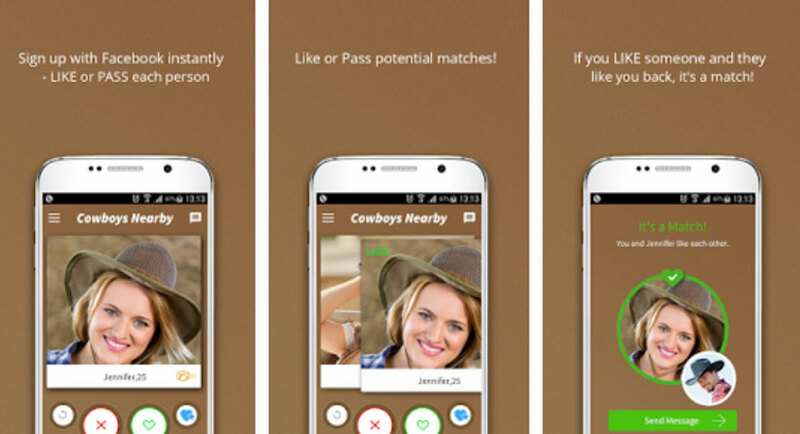 Cowboys Nearby is a Tinder-like dating site specifically made for handsome cowboys and girls who cannot resist their charms. It allows you to get to know exciting, love-seeking singles from your area and beyond and get tons of great matches within minutes from signing up. The registration process is simple and straightforward, so even if you are not at all tech-inclined, you can get started in a matter of minutes. You begin by creating an account, which can be done instantly via Facebook or by using your email address. Becoming a member is completely free of charge and you can access the basic features without paying a dime. As we mentioned at the beginning of this Cowboys Nearby review, the site employs a familiar, Tinder-inspired format. The members create profiles enriched with photos and interesting information about who they are, what they love, and what kind of partner they are looking for. As soon as you join, you get a bunch of potential matches and you can swipe right if you like what you see or swipe left if you want to move on to the next cute candidate. If someone you liked swipes right at the sight of you, you have got yourself a match and you can chat for hours, days or as long as you want before you decide to take the next big step and go on your first date. There are a couple of reasons why we love this site’s approach to online dating. First of all, there is no denying that swiping is incredibly fun. You get to discover dozens of attractive cowboys or cowgirls per minute and enjoy the sweet suspense of waiting to see if your love interest will swipe right as well. Plus, it is easy and comfortable, as you do not have to get straight to chatting. You can take your time browsing, exploring, and choosing until you finally get the match that makes your heart flutter. We wanted this Cowboys Nearby review to be as honest and accurate as possible, which is why we decided to give the site a try ourselves. At first, we thought that the membership base would not be too large since the site is exclusively dedicated to cowboy dating, but we were more than pleasantly surprised by the number and variety of its members. The members of our team, both ladies and gents, had an incredible time swiping and chatting and we were happy to see that the folks on the site are communicative, interesting, and wonderfully nice. Whether the match is right or not so right, you are sure to have a blast talking to like-minded singles who understand your lifestyle. We found no fake profiles to spoil the experience. Plus, we were glad to see that the membership base includes singles of different ages and interests, so it really seems that there is someone for everyone on Cowboys Nearby. Another advantage of this dating platform is that there are plenty of ways to customize your experience on the site. You can edit your dating preferences and easily find lovely singles who are close to you. That way, you do not have to worry about the drawbacks of a long-distance relationship, as you can find a perfect partner right there in your neighborhood. Unlike with some other dating sites that do not offer much to their premium members, with Cowboys Nearby, it really pays off to get a VIP account. You no longer have to put up with ads, you get full insight into which members like you, and you get to send more flirts, which significantly increases your chances of finding a match. You also get to go private and undo swipes and matches that you accidentally made. What is particularly important, as a VIP member, you show up first in the results, so you are sure to get much more right swipes. VIP membership does not cost much, especially if you opt for a longer subscription. You can try it out with the 1-month subscription that costs $14.99. If you enjoy the perks you get as a VIP, you can choose the 6-month subscription that costs $59.99 or the yearly subscription that costs $79.99, which amounts to only $6.67 per month. Cowboys Nearby also offers great mobile apps that allow you to swipe, chat, and flirt wherever you are. You get to instantly find out if you have got a match and talk to someone special anywhere, at any time. Now that you know what to expect, you can give Cowboys Nearby a try yourself. With so many happy couples who have already found love on this site, we have no doubt that you are just clicks away from thrilling sparks that may turn into the flame of true, lasting love. Just imagine that a couple of months from now, you may be telling your friends how you met the most important person in your life on Cowboys Nearby, a site you read about online. Isn’t that exciting? Tim and I are celebrating our six month anniversary and I remembered the words that gave me hope. Yes, I met the man of my life on Cowboys Nearby, just like you said I would! So I just wanted to say thank you and encourage everyone else reading this. I am crying a bit as I write this, because I know that there are many girls just like I was a couple of months back, who have lost hope in love. I am here to tell you all, never stop believing! Be brave and love will come! I did get plenty of matches right away, but no real luck so far. I am thinking about getting a VIP account, is there anyone who could tell me if it’s really worth it? I expected to find more ladies in their 40s, for older cowboys like me, haha! Jokes aside, I hope that more ladies my age will sign up soon, but so far, I have been having a lovely time.